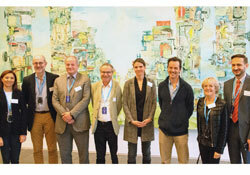 ETAGE is a body of 6–8 immunization experts appointed by the WHO Regional Director for Europe. This group is tasked with providing independent review and expert technical input to the Vaccine-preventable Diseases and Immunization programme (VPI) of WHO/Europe, with the goal of facilitating and accelerating achievements in relation to the eradication, elimination and control of vaccine-preventable diseases in the WHO European Region. ETAGE began as the European Advisory Group on the Expanded Programme on Immunization (EAG/EPI), which was established in the early 1990s to facilitate the development of the regional immunization programme. It effectively guided the programme for several years, particularly in relation to the revision of immunization policies in the newly independent states, to control the epidemic of diphtheria and to eliminate poliomyelitis from the Region. Since the late 1990s, many countries in the Region have undergone major health care reforms. To respond to such changes in systems and disease epidemiology, EAG's terms of reference were revised and ETAGE was established in 2003. A further revision was made to ETAGE's membership and operations in 2011 to ensure better alignment with ETAGE's parent advisory group at the global level, the Strategic Advisory Group of Experts on Immunization (SAGE) and with regional policies such as Health 2020. ETAGE works within the scope of the European Vaccine Action Plan (2015–2020) (EVAP), a regional interpretation of the Global Vaccine Action Plan that serves as a strategic framework for ETAGE, the Regional Office and immunization partners, donors and stakeholders in the Region.